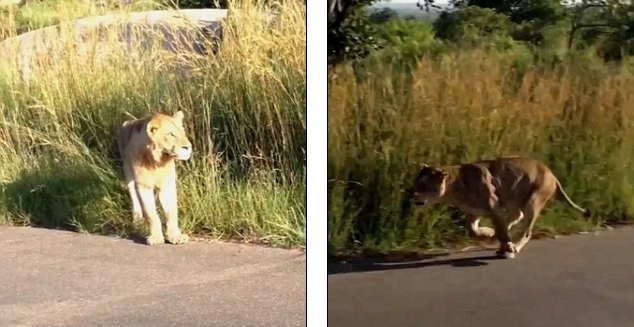 This is the dramatic moment a lioness attacked a male lion at a game reserve in order to ensure the safety of her cub. 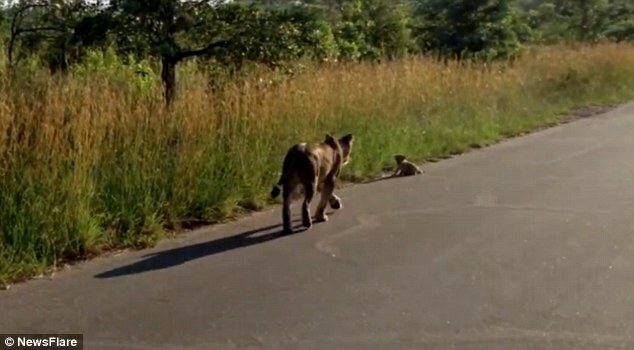 The tense incident – a norm in the animal kingdom, but not something regularly witnessed – was captured on camera by a visitor to the Kruger National Park in South Africa. In the video the lioness is filmed from a parked vehicle walking up the side of the H3 road with her cub trotting playfully behind her. The footage concludes with the mother heading back to her young cub before turning around to give the lion one last warning. After the confrontation the male lion crept and hid under the safari car for its own safety before heading off in the other direction. The mother then returned to her cub to ensure that it was safe from any other potential predator. Responses to "Never get between a mother and her child! Brave lioness fights off male rival"
Don't ever mess with Mama.